Hi all, got back from Hilltop Motorcycles yesterday afternoon, (4hr ride, rode up Friday late afternoon then stayed at the Longshoot hotel, which is cheap but a bit of a dump!) and have to say im impressed. 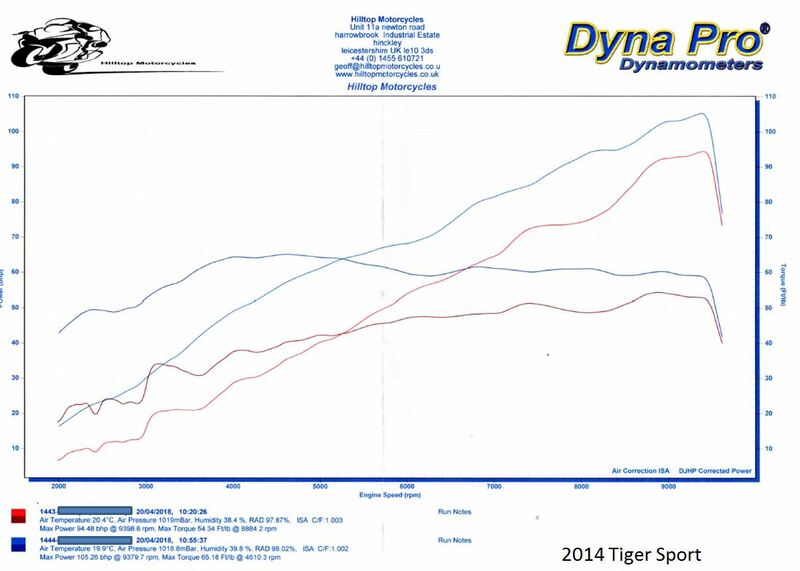 Tiger has actually got some claws now, as per the dyno chart. Much smoother with a lot more top end which is what i wanted. Decatting the standard downpipes was worth (buying from fleabay) doing. MWR HE air filter, and a Remus high level Carbon Hexacone with no baffle. Noise wise, at a steady throttle, you can hear a nice (to me) Triple rasp, louder when you "gun it", but still not as load as my Brutale 1090RR with its Arrow race system, WITH the BAFFLE in!? Plus as Mark and Geoff said, because its self learning on a longer/foreign tour/trip i'll put the baffle back in! (6mm allen screw). The ride home confirmed the dyno, just pulls and pulls, works brilliant with my Healtech Quickshifter!! Mark and Geoff at Hilltop are top blokes, highly recommended. Hi guys, yes sorry they are the same, must have double clicked or something. First time an' all that. Cheers Mark. Admin Edit: Duplicate image removed and original rotated. Hi all. I have my 2014 Tiger sport booked in for Hilltop attention on Friday morning following reading this thread. I'm looking forward to seeing the result from what I have read here. I'm looking for a smoother ride in the lower rev range and have found the bike can feel a bit twitchy in traffic. 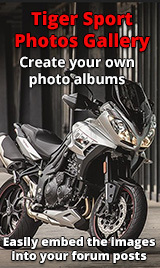 Apart from that, the bike is great. good move. the first time you open the throttle after they have worked their magic my advice would be HOLD ON TIGHT !! Sounds great. Looking forward to seeing the results. Please post the results chart also. Would be interesting to see the results with the earlier TS. Had my bike ECu attended to yesterday by hilltop and i must say I am impressed with the results. It seems to have really strengthened the mid-range. See attached dyno printout. Bike was running very lean and one of my plugs was faulty causing a slight misfire which was resolved with a plug change. 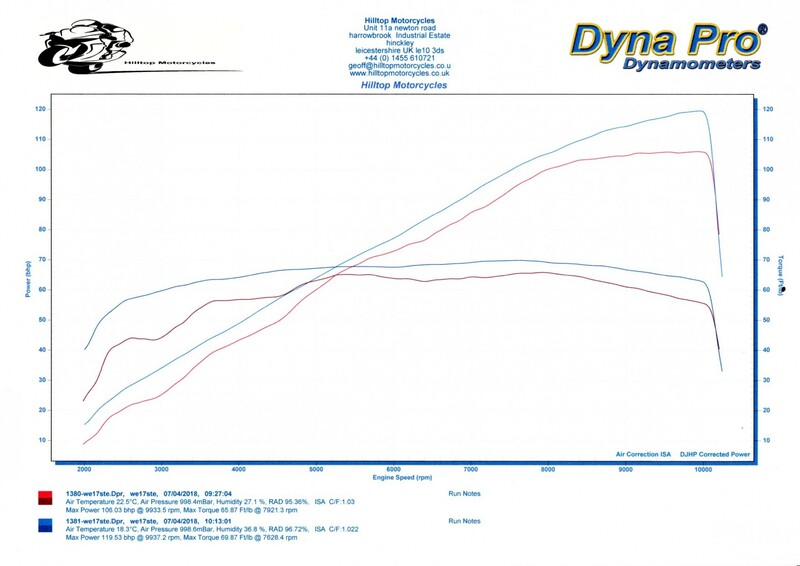 The dyno chart was with the misfire. Wow! Look at the difference between Westy46's bike and TRP1050's. Irrespective of the before/after changes there is a massive difference in the bikes. Either Westy46 has a particularly good one or TRP1050 has a particularly poor one. Or, and this is not an accusation just an observation, Hilltop's dyno operator is inconsistent when playing around with weighting factors. And anyone who understands anything about metrology can tell you what that means.